What to do for a meal on Christmas Day? For lunch, I smoked a turkey breast and made some home made rolls, but as J and I sat down to watch the Bears game, we both started to get hungry. I really wanted pizza, but every place I checked was closed. I had dropped it and figured I’d just get some left over turkey at halftime, but J kept looking. 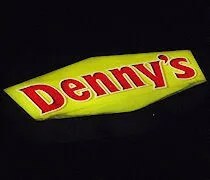 Earlier in the day, I had made a joke about our only two choices being Denny’s or IHOP. Last year, we ate at Perkins, but that’s closed now and not an option. As Josh McCown was driving deep in Green Bay territory, I heard J say, “mmmm Red Velvet Pancake Puppies.” I looked over at her iPad to see she was looking at the Denny’s menu. It was almost 10:00 but we sort of slept through dinner. I asked if she wanted to go and she said, “Sorta.” I figured what the hell. I was hungry too and it was one of the few things open. The only Denny’s location in the Kalamazoo Metro area is on the corner of Sprinkle and Cork just to the north of the I-94 interchange. While sitting at the stoplight, I could tell there were several cars in the parking lot so we weren’t the only ones jonesing for some non-holiday food. 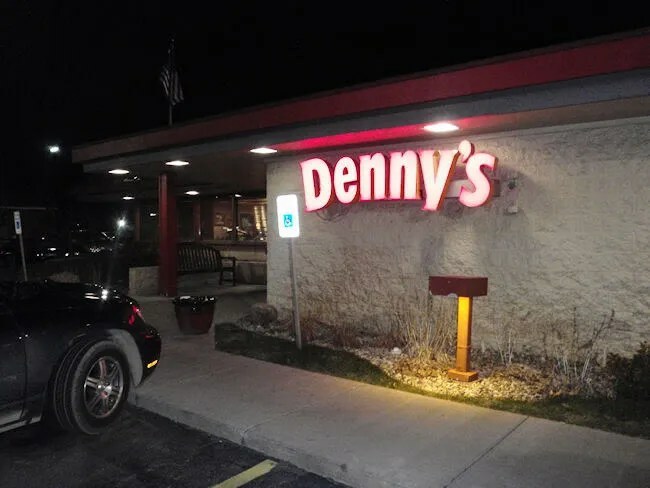 It has been several years since I’ve actually eaten at a Denny’s and of course, the last time I did, it was at a Denny’s in North Pekin, IL after a night of drinking. No surprise, the time before that was after a night of drinking in Bradley, IL. This was probably my first time eating in a Denny’s sober since I was a kid. My dad used to like the place, and like most old people, he still calls it Lenny’s….like it’s funny or something. When you enter the doors, you come to a hostess stand and a cash register. The restaurant is divided in to two sections with this area being the middle. In the archaic period, one side was the smoking section while the other side was non-smoking. After taking care of a couple at the cash register, a waitress came over and grabbed a couple menus then showed us to a table. She came back a few minutes later to get drink orders. They have Coke on the fountain so that’s what I ordered. J got a Cherry Cherry Limeade. A different waitress brought the drinks to our table about the time we were ready to order. The most interesting thing I found on the menu was the Bacon Slamburger. This is a pretty interesting creation. 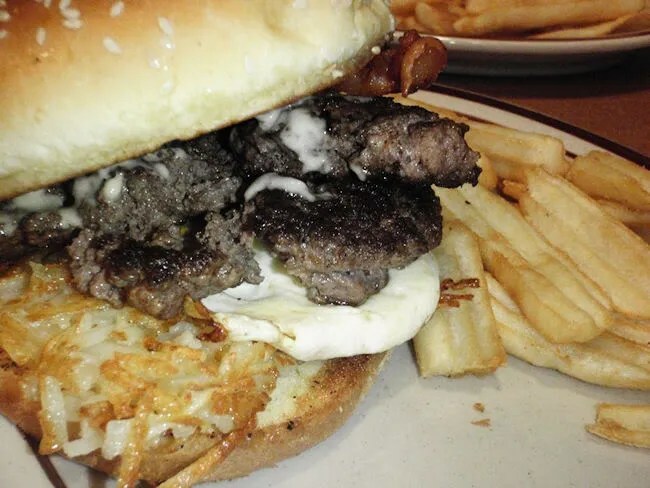 The hand-pressed beef burger is topped with bacon, a fried egg, hashbrowns, and a cheese sauce. I have no doubt that the burger is hand pressed because it was actually in pieces. The juicy pieces of beef were sort of haphazardly put on the bun then covered with the fried egg and bacon. The hash browns were underneath the meat and the cheese sauce topped the whole sandwich off. I’m very picky when it comes to hash browns and these were a little soggy for me. I was hoping for a really crunchy potato crust. It wasn’t bad and it was definitely and interesting twist, but I ended up scraping most of the potatoes off. I didn’t really need that many carbs and I ordered the burger because I really wanted the fried egg. I love eggs on burgers and this one did not disappoint. 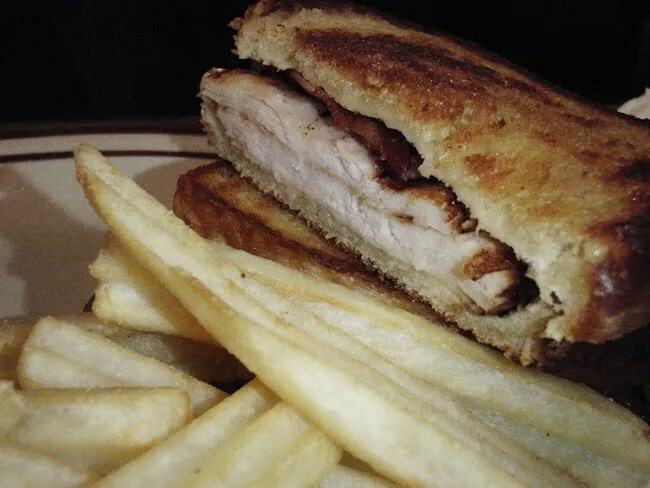 J thought my burger sounded really good and actually contemplated ordering it, but she stuck with a turkey sandwich….not sure if she forgot about lunch or just really wanted to eat turkey today. The sandwich is called The Super Bird. It’s two slices of grilled sourdough with thinly sliced turkey breast, Swiss cheese, bacon, and tomato. She said it was really good and saved half for lunch tomorrow. Both of our meals came with fries. They were pretty standard restaurant fries and there weren’t a whole lot. There was enough to send us both home satisfied, but the plates looked empty. Mine needed a tad more salt and J didn’t have any complaints about hers that I’m aware of. The bill for our late night Christmas Day excursion was a little over $20. The food is what you expect from a diner. It took a little longer than we were planning on, but we were warned before we ordered it would take about a half hour. It took a little less, but still longer than the greasy spoon local diners. We picked Denny’s because it was one of the few things open. We were both happy with our food and we both left stuffed. I really don’t have any complaints about the place. It is what it is and I was very happy they were open on Christmas.